Me (Nick DiMola) holding a vintage taxi cab meter from 1956! I found it on an apartment cleanout job in Queens. As you might know — or have come to learn after reading my blog — you find a lot of interesting stuff when you’re in the garbage business. Sometimes you find documents, paperwork and receipts from many years ago. I like to save stuff that tells a story. Now, this isn’t something that’s a big story but it’s just cool because I can put three pieces of this era together. American Express senders stub from 1956! On a Queens apartment cleanout years ago, I found a 1956 American Express senders stub dated June 1, 1956. This stub displays the amount that was sent and to whom it was sent. On a separate line it said “for,” which is where the owner would note exactly what it was being used for. This particular stub was used to send money for court. Whoever owned this stub paid a hefty price of $19.00. (As a joke, my cousin penciled in “Nick DiMola” and the amount of $100,000.00.) I put it in a glass picture frame, and set it next to a lot of other miscellaneous paperwork, documents and canceled checks that I’ve collected over the years. As I was going through my finds in my office, I found this magazine page that I know I saved because it showed the American Express ad. It was all ripped up and damaged around the edges so I cut it around the sides and saved it. This ad was from a magazine dated 1956. Looking at the picture in the ad, I noticed it said “rate, 25 cents first one mile” on the door of the taxicab. Think about that for a second — for just 25 cents got you a mile in a city taxicab! So I tried researching the 25 cents per mile and found a picture of a cab with the same writing on the door. 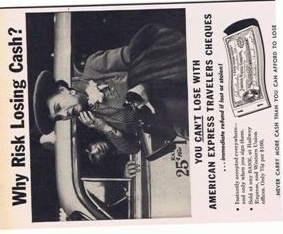 American Express magazine ad from 1956! Then, in my office, I came across an original taxicab rate meter made by Viking Electro-meter. The level on the meter says “vacant” when it stands upright, but when it’s pushing down, it triggers the meter to begin charging the fair. This meter records trips, units and one tenth of a mile, but it doesn’t tell me how much per mile. The bottom line is, I own my own vintage taxicab meter! I’m still researching to find out what year it’s from, but judging by its condition and style, I’d say it’s more than 40 years old. Now that I have an American Express sender’s stub, an American Express newspaper ad and an original taxicab meter, I’m hunting for an original taxicab rooftop light and the numbers on it. It seems like the perfect item to add to my collection! What is an apartment cleanout? An apartment cleanout job is a type of rubbish removal job. Typically, when a person is moving out of an apartment, he or she will call me to get rid of any remaining garbage, furniture or other items that are no longer wanted. Or, a landlord or building owner might call me to get rid of stuff that tenants have left behind. I might get called to do an apartment cleanout job if someone who had lived alone dies unexpectedly, Often there is an excess of items and belongings in the house that is left behind. Family members of the deceased may turn to an estate or apartment clean-out or rubbish removal service that provides skilled workers to handle the garbage removal job. They sometimes tell me it’s a lot easier than doing it themselves. When I step in, the family members can relax immediately because they know that the house will be taken care of and cleaned out, and they can focus on family time. An apartment clean-out in just one type of service that DiMola Bros offers; we also provide garbage disposal services, partial clean-outs, junk removal, furniture pick-ups, commercial or residential estate cleanouts, and full house or estate cleanouts, among other types of services. We work in all five boroughs of New York City — Manhattan, Queens, Brooklyn and the Bronx. ~ by DiMolaBros1956 on February 11, 2011. Hi. Just read your story above. Horsehair was also used for stuffing in mattresses. I know that beause, as a child, my mattress was custom made from a mattress store in Flushing New York. I was born in Flushing and still live here. I remember the S&H green stamps as my Mom used to save them. A lot of interesting information and it is very well researched. I have an adult admission ticket to the 1963-64 World’s Fair that I would like to sell. I read your story in the Queens Tribune recently. Also, I think you would enjoy watching American Pickers on the History Channel. It’s about 2 guys from Iowa who travel to different states, and buy “junk” and antiques. Nick, I know you would enjoy reading Stuff…I forgot the author, but it is a new non-fiction book. It’s about people who hoard stuff and starts off with the original hoarders The Collyer Brothers who had a mansion in NYC. You have a wonderful website, and I’m going to forward this site to my friends and family! You can contact me at the above email adress.